Distinguish between strong and weak arguments or inferences. Outline the general scientific method. Identify the critical elements of strong inference as a way of knowing. Identify and describe the roles of basic elements of experimental design: dependent and independent variables, positive and negative controls. What is a "STRONG" argument? 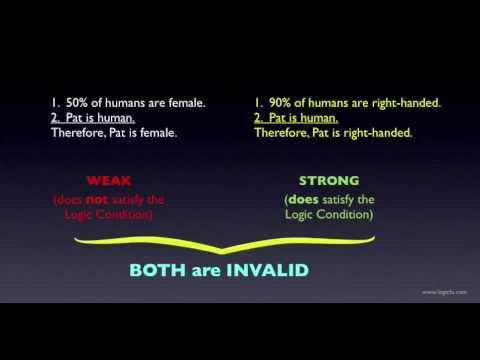 The first example in the video, that begins with all humans have DNA, and concludes that Pat has DNA, is an exercise in deductive reasoning. Logically correct deductive reasoning leads to valid arguments or conclusions. However, much of science is dedicated to constructing generalities or models from specific examples, and dealing with uncertainties. This takes inductive reasoning, reaching conclusions based on evidence, and distinguishing between strong and weak arguments. Scientific investigations use both deductive and inductive reasoning. Why are some scientists more successful than others? Is it just luck, or that some problems are just more difficult than others, or that some scientists are smarter or know more or work harder? Platt, who coined the term “strong inference,” thinks it’s a method of systematic scientific thinking (Platt, 1964). This Platt paper is required reading for students enrolled in Biol 1510! experiments designed to eliminate (falsify) one or more alternative hypotheses. These two essays by Platt (1964) and Chamberlin (1890, 1897, reprinted 1995) are not just classic, but timeless in that they remain relevant and stimulate much discussion today and will do so into the future. They are well worth reading and re-reading every few years. Well-designed experiments test hypotheses; they attempt to falsify (disprove or eliminate) as many hypotheses as possible. Typical experiments have one or more independent variables, some factor in the experiment that is set in varying amounts by the experimenter. Examples of independent variables include time or the amounts of a particular substance added to reactions or to cell cultures. Dependent variables are the outcomes that depend on the independent variables. Typically, the independent variables are plotted on the x-axis of a graph, and the dependent variables are plotted on the y-axis. The valid interpretation of experiments requires proper controls. Positive controls are experiments with known outcomes. Their purpose is to make sure that the instruments and reagents are all working properly. If an experiment with an unknown produces negative results, but the positive control produces the expected results, then we can be confident that the negative results were not due to faulty instruments or reagents. Conversely, negative controls are experiments that should produce negative or null results. They also guard against faulty instruments or contaminated reagents. An experiment with an unknown that produces a positive result is valid only if the negative control shows the expected negative result. Given that science is a way of knowing about the world around us (epistemology), what are the applications of strong inference outside the science laboratory? What are the similarities and differences between strong inference and clinical diagnostics (see any episode of House, M.D. ), or criminal investigation? What are the limitations of strong inference and the scientific method? Is it possible for the scientific method to definitively prove a hypothesis? Written by: Jung Choi on July 24, 2013. Last revised by: shanakerrMay 13, 2018. I highly recommend reading Science Isn’t Broken – It’s Just Hell of a Lot Harder than We Give It Credit for by Christie Aschwanden. This is a FiveThirtyEight feature on reproducibility of scientific studies, scientific misconduct, statistics, human fallibility, and the nature of scientific investigations. Has interactive analyze-it-yourself demo for readers to investigate whether the economy does better with Democrats or Republicans in power.